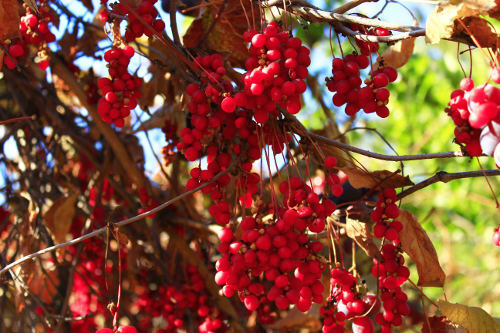 Schisandra is a medicinal berry that has been used in traditional Chinese medicine for thousands of years. Schisandra fruit is the herb that does it all. Chinese emperors, elitists, and, Taoist masters used schisandra along with other ancient Chinese herbs like goji berry, reishi mushroom, and ginseng. Historically, schisandra health benefits were used to balance yin and yang. The plant is said to calm the heart and quiet the spirit by having a positive effect on the kidneys, liver, brain, and lungs. Schisandra gained recognition as an adaptogenic tonic in Russia in the 1960s. Adaptogenic herbs help the body respond to stress; normalize physiological functions; increase energy, physical performance, and endurance; and recharge your adrenal glands. As a result, schisandra helps prevent adrenal fatigue. However, that is just one of the many health benefits of schisandra. Schisandra is commonly used to treat liver disease. The active ingredients in the plant can improve liver functions by boosting the growth of liver cells and stimulating enzymes, which are responsible for many biochemical reactions in the body. Schisandra fruit comes from the plant Schisandra chinensis, and belongs to the family Schisandraceae. The plant goes by many names, including schizandra and Chinese magnolia vine. In Mandarin, it is called wu wei zi, which translates as five-flavored berry. Basically, schisandra has all five tastes that include sweet, sour, bitter, salty, and hot. But, beyond the tastes, schisandra’s flavor components help understand how the ancient berry works. According to the five-element theory in traditional Chinese medicine, the tastes of schisandra berry benefit the qi (life force) of the five visceral organs that include the lungs, kidneys, heart, liver, and spleen. Because of its potential to impact nearly every organ system within the human body, there are dozens of reported schisandra health benefits and uses. Traditional Chinese medicine also recognizes schisandra as an herb that balances all three “treasures” within the body: qi, shen (spirit), and jing (essence). Certain mechanisms may allow these constituents to work similarly to phytoadaptogens, affecting the sympathetic, central nervous, immune, endocrine, cardiovascular, respiratory, and gastrointestinal systems. The antioxidants in schisandra may also positively affect smooth muscles, blood vessels, the biosynthesis of inflammatory compounds, and the release of fatty acids into the bloodstream. This improves circulation, and builds healthy blood vessels, arteries, and blood cells. This helps explain why schisandra may increase mental performance and endurance while working under stress. Although schisandra is best known as for boosting adrenal and liver function, it is also used as a powerful brain tonic to relieve stress, improve concentration, focus, mental energy, and memory. It may also support hormonal balance, nourish the skin, and improve digestive symptoms, especially when these issues are linked to liver transplants. The following are five reported schisandra health benefits. As an adaptogenic herb, schisandra may improve the body’s ability to deal with physical and psychological stress through balancing hormone levels. Schisandra may also improve resistance to emotional trauma, toxin exposure, anxiety, mental illness, and mental fatigue. A study published in the journal Drug Target Insights in 2007 suggested that the inhibitory effects of the adaptogens schisandra and rhodiola make them natural antidepressants that positively affect the hormones and brain function when under stress. Adaptogens also help prevent colds, flu, and chronic sinusitis. The high concentration of antioxidant compounds in schisandra could potentially help reduce inflammatory responses and fight free radical damage. As a result, schisandra may prevent heart diseases like atherosclerosis, balance blood sugar and treat diabetes, and protect against cancer. In regards to cancer prevention, active lignans from schisandra like schisandrin have been shown to have chemo-protective effects. Leukocytes promote inflammation, and studies suggest schisandra helps control the release of leukocytes, while also improving the body’s ability to repair tissue. A lot of research focuses on schisandra for liver function and its effects on production of various liver detoxifying enzymes. Liver health is linked to strong immunity; therefore, schisandra may protect against indigestion, infections, and various gastrointestinal disorders. A study published in the journal Phytotherapy Research in 2013 showed that patients experienced improved liver function and relief from fatty liver disease when sesamin was mixed with schisandra fruit extract. Studies also indicate that schisandra could treat chronic hepatitis and benefit patients after a liver transplant. Improving mental clarity and performance is one of the oldest uses of schisandra. It has been used for centuries in Russia to promote stamina and in traditional Chinese medicine to improve concentration, memory, motivation, and mental health. Caffeine can cause restlessness, nervousness, and an irregular heart beat. Schisandra on the other hand has the opposite effect of caffeine, and it can make you feel calmer while fighting fatigue. A study published in the Journal of Ethnopharmacology in 2013 suggested that schisandra fruit extract may be useful in the prevention and treatment of Alzheimer’s disease. Studies also link schisandra consumption and protection against psychiatric and neurological disorders like depression, neurosis, anxiety, schizophrenia, and alcoholism. Schisandra may work as a beauty tonic capable of protecting the skin, including from sun or wind exposure, dermatitis, allergic reactions, toxin accumulation, and environmental stress. The anti-inflammatory effects in schisandra make it possible to treat skin problems. In one study published in the journal Molecular Medicine Reports in 2015, researchers found that schisandra extract inhibits ear swelling through the reduction of the inflammatory skin disorder markers: immune cell filtration, skin dermatitis, and cytokine production. Take one to three grams of schisandra pills daily with meals. Experts recommend no more than three grams of powdered schisandra each day. Make schisandra tinctures with a 1:6 ratio of water and pure dried schisandra extract. You may be able to find an already prepared tincture. Take 20 to 30 drops of the schisandra tincture per day. You can split the dose twice daily, while taking it with a meal. Schisandra is also available in teas or wines. You can also make brewed wines and teas featuring schisandra. To do this, steep up to three grams in hot water for 40 to 60 minutes before consumption. For enhanced benefits, add other herbs like turmeric, licorice root, cinnamon, or ginger. In summary, the reported schisandra health benefits include supporting adrenal function, reducing inflammation, protecting the skin, improving digestion and liver function, and improving mental performance. Is Schisandra Safe to Use? According to Web MD, schisandra is possibly safe to consume orally, though minor side effects may include skin rash, upset stomach, loss of appetite, heartburn, and stomach pain. Although no major side effects have been reported, most research on schisandra investigates on animals, and not humans. For this reason, pregnant and nursing women are not advised to take it. Schisandra may also affect the way other supplements or medications are absorbed in the body. A study of rats given liver-damaging amounts of acetaminophen found that a constituent called gomisin had some possible liver damage effects, but would not prevent glutathione depletion. Some studies have also found that schisandra interacts with drugs used for cancer treatment. Schisandra impacts how drugs are processed in the liver; therefore, it may reduce the effects of these drugs or increase the risk of toxicity. For these reasons, it is always best to talk to your doctor or natural health practitioner before using schisandra or any other herbal treatment. “Schizandra Berry (Wu Wei Zi),” Chinese Herbs Healing; http://www.chineseherbshealing.com/schizandra-berry/, last accessed March 9, 2017. “Schizandra,” Dragon Herbs; http://www.dragonherbs.com/prodinfo.asp?number=548, last accessed March 9, 2017. “Wu Wei Zi Schisandra Fruit/Seed – Chinese Herbal Medicine,” Yin Yang House Theory website; https://theory.yinyanghouse.com/theory/herbalmedicine/wu_wei_zi_tcm_herbal_database, last accessed March 9, 2017. “Schisandra: Ultimate Superberry,” Medicine Hunter; http://www.medicinehunter.com/schisandra, last accessed March 9, 2017. “Top 11 Scientific Health Benefits of Schisandra,” Self Hacked; https://selfhacked.com/2016/05/11/schisandra/, last accessed March 9, 2017. “Top 11 Benefits of Schizandra,” Surthrival, January 30, 2014; http://www.surthrival.com/news/schizandra-benefits/. “Schisandra,” WebMD; http://www.webmd.com/vitamins-supplements/ingredientmono-376-schisandra.aspx?activeingredientid=376&activeingredientname=schisandra, last accessed March 9, 2017. “Schisandra,” Gaia Herbs; http://www.gaiaherbs.com/products/ingredient/234/Schisandra, last accessed March 9, 2017. Lee, H.J., et al., “Effects of Schisandra chinensis Turcz. Fruit on contact dermatitis induced by dinitrofluorobenzene in mice,” Molecular Medicine Reports, August 2015; 12(2): 2135-2139, doi: 10.3892/mmr.2015.3618. Jeong, E.J., et al., “The effects of lignin-riched extract of Schisandra chinesis on emyloid-beta-induced cognitive impairment and neurotoxicity in the cortex and hippocampus of mouse,” Journal of Ethnopharmacology, March 7, 2013; 146(1): 347-354, doi: 10.1016/j.jep.2013.01.003. Chiu, H.F., et al., “Improvement of liver function in humans using a mixture of schisandra fruit extract and sesamin,” Phytotherapy Research, March 2013; 27(3): 368-373, doi: 10.1002/ptr.4702. Panossian, A., et al., “The adaptogens rhodiola and schizandra modify the response to immobilization stress in rabbits by suppressing the increase of phosphorylated stress-activated protein kinase, nitric oxide and cortisol,” Drug Target Insights, 2007; 2: 39-54. https://www.ncbi.nlm.nih.gov/pubmed/21901061.